Residential masterplan and landscape strategy. A residential masterplan for 160 new family homes on a 4.4ha site in Lostock Gralam, near Northwich. Outline planning approval was given to the project in January 2011 which was a big success as residential development in this site went against planning policy. 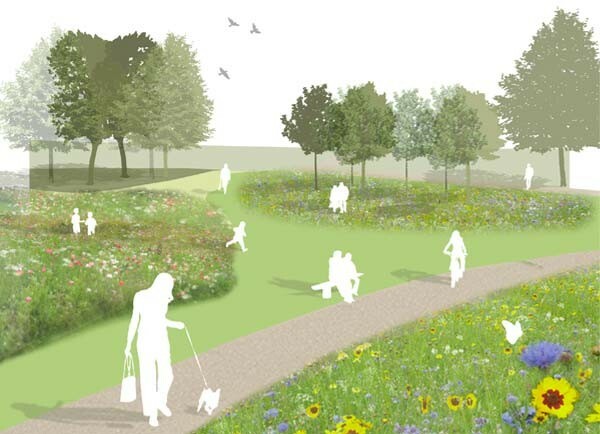 Existing landscape features are retained to provide an immediately established setting for the new development, including the existing recreation ground and woodland area which provide a fantastic opportunity to create enhanced open spaces for new residents and the surrounding local community. A new wildflower meadow creates an attractive landscape and enhances biodiversity, while areas of mown grass provide opportunities for relaxation and informal play. The remnant of Lostock Long Wood is protected and enhanced, while existing trees and hedgerows are retained as much as possible to protect the distinctive character of Stubbs Lane. A complimentary palette of high quality materials is proposed for the site. Home Zones create attractive streets with a sense of space that give priority to the pedestrian, while motorists are forced to drive with greater care and at lower speeds. Surface materials, street furniture, trees and planting beds are used to alter the street layout and enhance residential areas. Doors and windows of properties face onto the public realm to create safe streets and open spaces. Carolyn Willitts was the project landscape director for the project and created the landscape graphics.